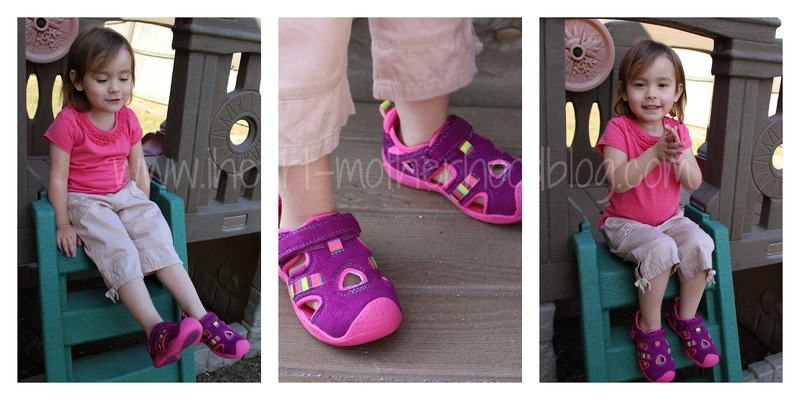 I've always adored pediped footwear for my children's little growing feet, created by Angela & Brian Edgeworth in 2005, they set out to create a comfortable & stylish shoe that was healthy for their daughter's feet! Pediped's shoes are the "next best thing to bare feet", they offer three footwear lines for boys & girls feet which include Originals (soft soled shoes for newborn to age 2yrs), the Grip 'n' Go (soft rubber soled shoes for ages 9mths to 3yrs) & finally the Flex (rubber soled shoes for ages 1-8 yrs). You can find pediped shoes around the world & their entire line can be purchased online, from boots to sandals, athletic shoes & more, you & your children will fall in love with pediped's cute & colorful shoes! I was sent the Flex Amazon in Berry for Little Sister C, she was so excited to see her new shoes & couldn't wait to try them out in the beautiful "spring" weather we are having here in TX! The Flex Amazon in Berry is the perfect adorable shoe for your little adventurer! From mud, to sand, even in the water, this shoe can withstand anything! The Amazon was made with eco-friendly materials, features all natural rubber sole, protective toe caps & has a velcro strap for easy on & off & secure fit. Did I mention the Amazon is machine washable & water-safe? If these darlings happy to get dirty, just toss them in the washer & they will come out nice & clean! My daughter loves her new shoes, she said they are soft & comfortable, of course she noticed the bright colors right away!! She has a little bit of room to grow into them which is great, I can't wait for her to visit our local spray ground in her new pediped shoes! Angela Edgeworth also has a beautiful women's footwear line called Brian James, be sure to stop by & check out their new Spring/Summer styles! Purchase the Flex Amazon in Berry online for $49 along with several other adorable spring styles from pediped! Stay connected with pediped on Facebook, Twitter & Instagram! These are super cute, my daughter would love these!